Nottingham Forest vs Newcastle United League Cup match preview | NUFC Blog. Newcastle United are in action this Tuesday night, with a visit to see Dutch impressionist, Steve McClaren, and his struggling Nottingham Forest side. The Magpies defeated a spirited Scunthorpe United team 2-1 in extra-time to earn a visit to the City Ground, while Nottingham Forest dispensed of rivals Notts County on penalties, after a 3-3 draw at home. There is no scheduled live broadcast for the match, so it will be time to scour the wonders of the world wide web once again to find a stream. Pop back here tomorrow for our match banter, and maybe someone may have been kind enough to share a link for you. If you find a decent one yourself, feel free to share your discovery with the rest of us. Newcastle are coming into this game off the back of an impressive away performance at Villa Park, where in fairness, United deserved more than the point they earned. Nottingham Forest are probably still a little upset about their defeat to rivals Derby County at the weekend, it certainly seemed that way while I was at the Nottingham train station on late Saturday afternoon anyway. Newcastle’s last visit to Nottingham was in October 2009 during our Championship season, where we were defeated 1-0 thanks to a Dexter Blackstock strike. 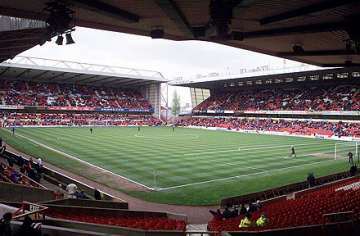 Nottingham Forest: (From) To be updated. Newcastle United: (From) Krul, Elliot, Harper, Simpson, R. Taylor, Ferguson, Coloccini, S. Taylor, Tiote, Cabaye, Gutierrez, Marveaux, Obertan, Gosling, Guthrie, Ben Arfa, Ba, Shola Ameobi, Lovenkrands, Best, Sammy Ameobi. I expect to see Marveaux and Gosling play, as will Danny Guthrie. Lovenkrands and the Ameobi brothers may also start the game. James Perch may get a start at centre back, and that’ll be interesting to see how he handles it, if he does play there. We can also see if there really is a need to over panic if we lose Coloccini or Steven Taylor at any time during the season, due to suspension or injury. Nottingham Forest have Marcus Tudgay, George Boateng, Chris Cohen and Paul Anderson (not the director) all currently injured. I think we’ll stick with the 4-4-2 formation, with Rob Elliot keeping goal for what would be his Magpies debut. To be honest, it really is difficult to pick a team and formation for this match. As you probably know by now (if you’ve been reading my previews), I prefer the 4-2-3-1 formation, but I think we will play that more often to accommodate Ben Arfa. So if he starts, we’ll likely play with the one striker. I still expect us to field a strongish first eleven, as it would be stupid to not actually try and win something that teams such as Oxford United have won more recently, than our last trophy triumph, the same year in which Neil Armstrong set foot on the moon in 1969. Allegedly. Newcastle have a good chance of progressing to the next round tomorrow night, and I’ll be disappointed if we don’t pick up the win. Nottingham Forest are not doing too well at the moment, but these are the type of annoying games where a win or defeat for either team, could have interesting repercussions. I think Marveaux and Gosling will put in good performances, since they’ll want to impress Pardew and get themselves in the first eleven come Saturday afternoon against Blackburn. Somewhat of a forgotten figure, Danny Guthrie, will also want to impress, though he may be forced to play in a more holding role, to allow Gosling to roam forward. I’m sure all of us are excited for what could be Hatem Ben Arfa’s 52nd potential come back for Newcastle, and we’ll all be keeping a close eye on him. Steve McLaren: “It will be a long time before we can go out in Nottingham again – and rightly so. But we have the chance to regroup when we play Newcastle in the Carling Cup, and, whoever shows up, we have to produce a performance to be proud of. Alan Pardew: “It’s a competition we feel we can do well in. We’ve got a lot of players who haven’t featured and are desperate to show their wares, so to speak. Be nice to get a cup run together heard Partridge is making many changes see what happens. Hmmm. I hope there is one somewhere, but I have a feeling of foreboding about this one. Still top of the league I notice SJT, and there’s a bit of a gap building too. You’ll be getting a mention in the “match banter” the morra. Maybe one of the Toon based supporters will hook up their radio to UStream? Yeah it’s tight at the top as well…us cockney bastards know what we’re on about. Come on The Fookin Spuds !! I could be wrong but I think some organisation, maybe Sky/FA, is clamping down on streams in general. That might sound paranoid but its “Subscription Time” at Sky and football pays their bills. Recently noticed that streaming url’s, which get published, often get canned before the end of the transmission ? So my advice to all is try to choose a lesser known stream (maybe with foreign language) rather than the usual suspects. Here’s a starter for ten ! “Yeah it’s tight at the top as well…us cockney bastards know what we’re on about. Chas without Dave was live on the old Joanna dahn the local rub-a-dub the other week, but sadly I missed it. Sounds like we already have some pre-match banter. Big thanks to Physix (?) for posting the link to the Villa match on Saturday. Greatly appreciated! Worky, cheers for adding the managers bit. Not my best preview, though I’m still struggling to function after the weekend. Worky Cahmonyouspursah My Dad invented that. Love The Spuds me just follow Newcastle part time cos they are like humble and quaint oop Norf. I don’t think HBA will start AndyMac, I’m hoping he does too, but I reckon It’ll be an early 2nd half introduction maybe. Jimbob, one of Hugh’s pieces was blocked by Newsnow for the exact same thing, though strangely, it’s the first time it’s ever happened and they’ve published several articles from other sites with the same word completely uncensored since then. It’s possible that we have been reported by someone, so we must be careful. No problem mate. I will scour as usual to find a stream if there is one. There was not one for the last CC match that I was aware of so hopefully this time there is, especially if Benny is getting a run out at some point. Elliot, HBA, Sammy, Ba, Taylor, Tiote, Cabaye, Ferg. Best should get some game time as we’re up against his arch-enemy (he’s a notts magpie). Perch used to play for NF too, so should get on. Harper too, if he’s fit again. Please God let there be a live stream, I couldn’t bare miss Benny Arfa’s hugely anticipated and overdue comeback appearance. I think he’ll be brought on at the hour mark as Pardew wouldn’t want to overplay him due to possible extra-time. Maybe he’ll give him the first half? A competition we could actually win (as in a trophy – remember trophies, open-top bus parade, celebrations) and what are we talking about? A weakened team with (I kid you not) a chance for youngsters Shameobi & Lovers to show what they can do (which we know, my god do we not know). So why on earth do we not go all out for matches we can win – and leave changes for games we probably can’t – especially when we are on a roll and confidence is high. Amongst all the baffling tripe Rud Guillet spouted there were actally a couple of jems – especially the point that you win things against poor & average teams not good teams – in other words rest your players against the top teams not the likes of Forest! So, go hell for leather for the next six games. THEN unleash our secret weapons Shameobi & Lovers in the games we havn’t got a snowballs chance in manchester of winning! Well, it might just take them by surprise! Right here is a link for the forest game that you AL need do I get a prize!!!! Photoshoppery or the real thing ? As for tonights line up, the papers are saying that Mehdi Abeid will start tonight ! That would sit nicely with a 4-2-3-1. Interesting picture of the new sign too Andy. It looks even worse than I thought it and and is crass in the extreme. It’s going to look worse still with all those huge Sports Direct banners covering the empty seats too. There are over sixty Sports Direct signs at SJP now. Need a link to the game guys? ?